Elizabeth Scott is a renowned YA author, known not only for the quantity of her books (12 so far) but for the breadth of her style. She's written romances, an extremely disturbing kidnapping book, and contemporary issues books. 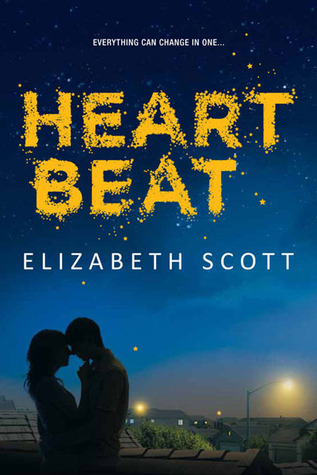 Heartbeat falls into the contemporary YA issue novel category. As it says in the synopsis, Emma's mother recently died from a freak accident but is being kept alive as a vessel for her unborn child. The synopsis also implies that a romance is at the heart of this novel and it is indeed a large part of the eventual plot. But the true "star" of this novel is Emma's anger. Emma is livid that her stepfather is keeping her mother alive until their baby is viable. She is convinced that Dan doesn't care about her mother at all; all he wants is the kid. She's deluded herself into thinking that her mother never wanted the baby in the first place, she only got pregnant to make Dan happy, so her death is Dan's fault. In an objective sense, I understood her anger. People deal with grief in different ways and anger is one of those ways. Similarly, her stepfather seemed detached, because that's partly how he was dealing with his own grief. But subjectively, I wanted to bash her head in with a mallet. First of all, it was obvious to everyone but Emma that her stepfather was wonderful - treated Emma as his own child - and was doing what he thought Emma's mom would want. Second of all, I can't understand Emma's anger at her mother being kept alive for the fetus. It's not like she had anything better to do. Kind of like being an organ donor. Since my hatred for Emma overpowered everything else about this book, it was very hard to read. Otherwise, it was a perfectly fine novel. It's well written; the pacing is fantastic. By using short sentences and short chapters, Ms. Scott managed to convey heightened emotion and immediacy. I was able to finish the book in a few hours - not because I was skimming but because the book flowed so well. The romance is good. Caleb is the typical bad boy with a damaged side. And he does have good reason to rebel. What a horrific set of parents. Kind of one dimensionally bad, but on the other hand, I believed it. Emma and Caleb's relationship progressed quickly but not in a way that felt like insta-love. And Emma's slow emergence out of her monstrous shell into a decent human being was - albeit somewhat rushed - a logical outcome as their relationship grew and other events occurred. Heartbeat is an instance of a good book hitting my negative emotions very hard. I can't say I enjoyed this book, because Emma infuriated me so much, but I know quality writing when I see it. If you like well written issues novels and don't mind unlikable characters, this will be a good book for you. Emma really grated on my nerves, too. In theory, this novel should have worked seamlessly for me, but I felt too much of it was petty and not nearly in-depth enough for me. I'm glad to see I'm not alone. Great review, Alison! I have an ARC of this one and now I'm not sure whether to hold on and brace the unlikable characters or just to pass it on. The news bit you added at the end of the review made my eyes go wide. How freaky is that?! Yes I agree about Emma too. Overall thought provoking book, but the character ruined the story for me too. Aw, sorry that you didn't connect with Emma. Thanks for the heads up that this was in the news! I just passed this book on. I'm almost positive it's not for me. Nice review! I agree that this issue is very emotional and hard. And I have been looking at the case in Texas. So sad for everyone involved. I did tell me husband that if anything were to happen to me and I was pregnant, I told him to keep me alive for our baby. That baby is the last part of me and I want my husband to have that. I feel like this is a great book for discussion (especially because of the real-life connection and I believe I've heard of other similar cases too). Sorry you couldn't really connect with Emma as this book was an overall winner for me! I don't know where I stand with Scott. I hated her contemporary lead in one book loved her character in her infamous kidnap story. I'm not really sure if I'll pick this one up as quickly as I had planned. Great review! My review goes live on Thursday. I felt pretty much the same as you did. Emma... ugh. I wanted to slap her. And Holy crap hole!!! I saw that in the news over the weekend. I was telling my husband all about how I had just read this book and how weird it was that that story is in the news now, because I had the book on my kindle before any of that stuff ever happened and the stories are eerily similar. Right down to it happening in the kitchen.